Three weeks ago, I received a letter from a cousin who lives outside of Seattle. She, her husband and 2 of her children, would be passing through O'Hare on their way home from a spring break spent in Williamsburg, Virginia. They were to have 4.5 hours in "Chicago". Would I have time to get together? Of course! Absolutely! Don't have to ask me twice. You do, however, need to remind me because my brain can, on some days, resemble a sieve. Thankfully, she sent me a postcard from Williamsburg, which jogged my memory. I had planned to do one thing on Saturday but that was very easily postpone-able. 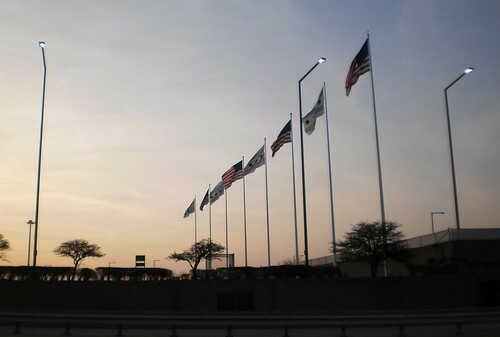 It was a phenomenally nice day, which made it perfect for a quick jaunt up to the airport. Unfortunately, between Richmond, Virginia and Chicago, Illinois, there were quite a few heavy thunderstorms. Their plane was delayed. They were delayed. It wound up being a good 2 hours, which meant we had no time to leave the airport environs to grab a quick bite at any local restaurant and get them back in time to endure security. Our visit consisted of commandeering a table and chairs next to a lower level convenience store. But what a visit it was. I have not seen her since she moved to the west coast from Illinois where she was going to college some 29 years ago. She's gotten married, had a family and sent children off into the world. We have kept in touch through occasional letters and always at Christmas, but it is different sitting across the table from them. In a way, it was as if that time never existed. We got caught up on everyone; where my child is and what her children are doing. We talked relatives. Her son is very interested in the family genealogy and I'm a link to the family in Iowa. I have only one of my father's siblings left and 2 cousins have passed away, one of whom I could not remember his name for the life of me; still can't. I know his kids. I know his brother and wife, but his name is like fog at 10 a.m.
We talked memories, of winters spent on the farm. She grew up in California so coming for Christmas one year was fantastic. I remember how we wrapped a Cool Whip container of snow in so many layers of newspaper, it was the size of a boulder. It was partially melted when they got home but still resembled a snowball. We talked about how life changes, how life doesn't and all too soon, it was time for them to join the lines snaking through security. I didn't visit her when Carole lived in the Seattle area. I really wanted to get my daughter settled and I wanted to spend the time with her. I probably should have reconnected. They would have welcomed me as family, as they did as we sat around a table in O'Hare. I felt awkward to suddenly call out of the blue and "Oh I'm in the area." That was my fault. I should have 'gotten over myself'. Still, this was a wonderful 90 minutes spent in an unlikely place on a marvelously beautiful spring afternoon.